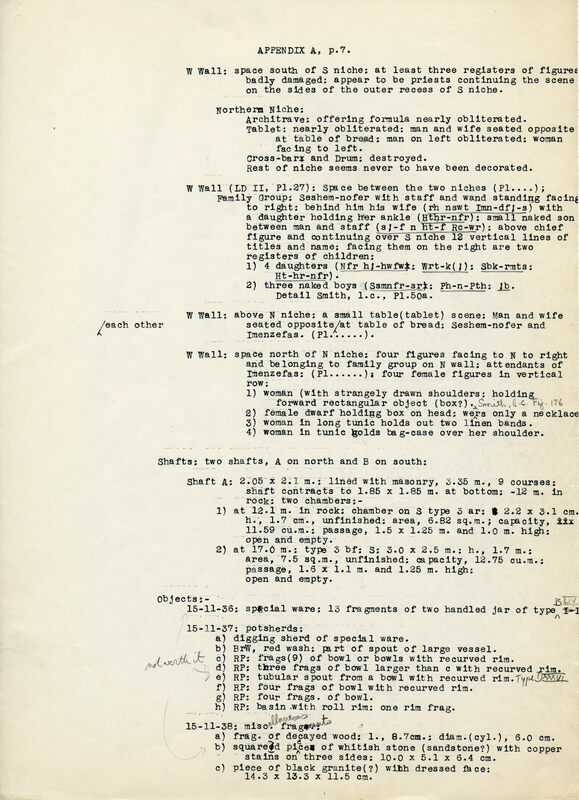 *Original paper documents for Appendix A: Cemetery en Échelon are in archival box K11 in the Egyptian Section archives of the Museum of Fine Arts, Boston. Remarks Wife ([Hmt=f] his wife) of Seshemnefer [I] (owner of G 4940). Appears in chapel relief (west and north walls), identified as [rxt nswt] royal acquaintance; in situ in G 4940. Mother of Pehenptah (owner of G 5280). Limestone standing pair statue (12-10-3 = KHM Vienna ÄS 7502) inscribed for Pehenptah and his mother Amendjefaes; found in G 5280 serdab. Shattered triad statue (12-10-4 = MFA 13.4330 triad + 12-10-4 = MFA 13.4358 fragment of female figure + 12-11-22 = MFA 13.3160 fragment of male figure proper right) of Pehenptah and his mother Amendjefaes; found in G 5280 serdab (some fragments from outside serdab). Remarks Daughter of Seshemnefer [I] (owner of G 4940). Appears twice in chapel relief, twice on west wall (between false doors: north end, upper register, last figure on right, and south end, holding her mother's leg); in situ in G 4940. Remarks Daughter of Seshemnefer [I] (owner of G 4940). Appears in chapel relief, west wall (between false doors, north end, upper register, first figure on left); in situ in G 4940. Remarks Owner of G 5280. False door inscribed for Pehenptah; found in situ in G 5280. Limestone drum lintel (39-9-2) inscribed for Pehenptah, identified as [rx nswt sS a n nswt] royal acquaintance, royal document scribe; found displaced in G 5280. Limestone standing statue (12-10-2 = Cairo JE 44609) inscribed for Pehenptah and limestone standing pair statue (12-10-3 = KHM Vienna ÄS 7502) inscribed for Pehenptah and his mother Amendjefaes; both found in G 5280 serdab. Shattered triad statue (12-10-4 = MFA 13.4330 triad + 12-10-4 = MFA 13.4358 fragment of female figure + 12-11-22 = MFA 13.3160 fragment of male figure proper right) of Pehenptah and his mother Amendjefaes; found in G 5280 serdab with some fragments from outside serdab. Son of Seshemnefer [I] (owner of G 4940). Appears in chapel relief, west wall (between false doors, north end, lower register, second figure from left); in situ in G 4940. Remarks Owner of G 5270. Base of limestone statue (KHM Vienna ÄS 8544) and fragments of frieze-text originally from over serdab (Cairo JE 43965) inscribed for Rawer, identified as [sS a n nswt rx nswt sS n Xrt-a nswt sS a n nswt xft-Hr] royal document scribe, royal acquaintance, scribe of the royal document-case, royal document scribe in the presence; found in G 5270. Son ([sA=f n Xt=f] his son of his body) of Seshemnefer [I] (owner of G 4940). Appears in chapel relief, west wall (between false doors, depicted as young boy standing in front of his parents); in situ in G 4940. Remarks Owner of G 4940. North and south false doors inscribed for Seshemnefer; also appears in chapel relief (north, west, east, and south walls), identified as [rx nswt Xrj-tp nswt Hwt Hr-xpr xt HA Hm-nTr Hqt Hm-nTr Hr THnw qA-a sAb aD-mr wr mDw Sma Hrj-sStA jmj-r kAt nt nswt jmj-r sSw Xr-a nswt Hrj-wDbw m Hwt-anx jmj-r stj-DfAw smr Hm-nTr jnpw xrp aH] royal acquaintance, royal chamberlain of the funerary temple of Horkheper (Djedefre), khet-priest of Ha, priest of Heqet, priest of Horus of Libya, elevated of arm, judge and administrator, great one of the tens of Upper Egypt, secretary, overseer of royal works, overseer of scribes of the royal portfolios, master of reversion-offerings in the Mansion of Life, overseer of the two places of provisions, companion, priest of Anubis, director of the palace; in situ in G 4940. Remarks Daughter of Seshemnefer [I] (owner of G 4940). Appears in chapel relief, west wall (between false doors, north end, upper register, second figure from left); in situ in G 4940.